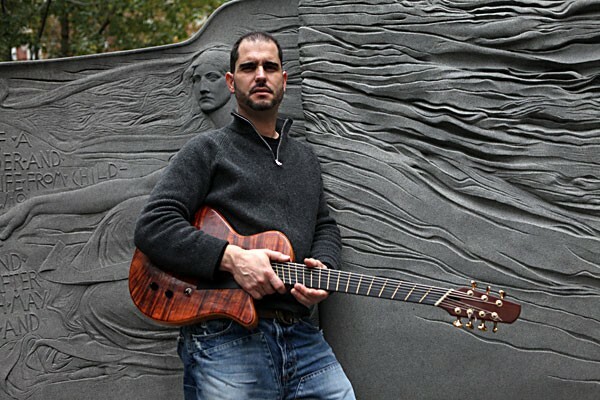 Jazz guitarist Charlie Hunter rose to the top of the Bay Area music scene with a custom 7-string axe and a masterful style that allowed him to play bass and lead at the same time. In the '90s, he moved to jazz central, New York City, and found more success, landing a contract with the prestigious label Blue Note. After making his way to the top, Hunter then climbed back down the ladder just a little, returning to the indie world. His upcoming record, Gentlemen, I Neglected To Inform You, You Will Not Be Getting Paid, was self-produced. And yes, there's more than a hint of irony in the title. "If you're a musician, you're on the lowest rung in the music business. That hasn't changed, the lowest rung just got a little lower," he said calling from his New Jersey home. "It's definitely a lot harder to make a living now than it ever has been, that's for sure. But you know, it's the same for every other industry except for maybe the Mafia and investment banking." Since he's not a banker or a Mafioso, he had to find a low-cost way to record. "Since it's all my own money, I had to think of something that was cheap to make, that still sounded good. I figured, we know what we're doing - we know how to play a tune from beginning to end - so we did it the way they used to - we recorded direct to half-inch tape, mono. I love the mono sound, and when you record that way you don't have to spend time mixing, so I did the whole record in two days. Done. Everything out." The horn-heavy Gents included Curtis Fowlkes and Alan Ferber on trombones, Eric Biondo on trumpet and Dap Kings drummer Eric Kalb. "I wanted to have the guitar and whatever thing I do as the lead voice, then have the horns playing the parts," he noted. Now he's heading out to play songs from the new album, but he's not bringing the whole band on the tour that brings him to the Red Fox Tavern Saturday night. "It's just too expensive to take five guys out," he said. "Alan Ferber and Eric Kalb will be on the whole tour; they'll be with me in Eureka, and we're picking up extra musicians for some other gigs. If you come to Yoshi's, we'll have the whole band, with Curtis coming out and Ron Miles on trumpet." If you've followed Mr. Hunter's career closely, you know he was also a co-founder of Garage A Trois, a jazz/jam combo formed in 1999 with Galactic drummer Stanton Moore and the mad saxophonist Skerik from Critters Buggin etc. Percussionist/vibraphonist Mike Dillon (also from Critters) came aboard later. When Charlie left the band in 2007, they added keyboard player Marco Benevento of Benevento/Russo Duo fame. That's the quartet on the wild new Garage A disc, Power Patriot, and the group that will play at the Red Fox Friday, the night before Hunter's gig. When Harper Simon's publicist punched me through to him in L.A., he'd been doing interviews for hours. What question was he tired of answering? "Anything having to do with my dad or my family," he replied without hesitation. Since his dad is Paul Simon, it's a common inquiry. As a kid, Harper played on stage with his dad, his dad refers to him in songs, and frankly, the harmonies on Harper's eponymous debut album sound like old Simon and Garfunkel records. Backing came mostly from veteran Nashville players, who will not be touring with Harper when he hits Humboldt Brews this Thursday. "The sound is different because I have a different kind of band," he said. "I'm trying to push toward a new sound rather that trying to recreate arrangements from the record." Instead he's moving into "dark psychedelia, like Nick Drake and Velvet Underground meeting Elliot Smith and The Pixies." He's touring with The Chapin Sisters, Abigail and Lily, daughters of folk singer Tom Chapin (and nieces of Harry). Have you been missing songbird Lila Nelson since she flew south? She's back Friday for a show at Arcata Theatre Lounge; an EP release thing for a disc called We Never Came. Lila and KHUM's Mike Dronkers assembled a few of what Lila described as "hundreds of songs" recorded in Mike's Pirate Room home studio. Dronkers says that's a slight exaggeration, but there were many more laid down during sessions before and after she moved away. "She'd do three or four takes on a song then head home and I'd stay up late adding things to it," he explained. Since Lila's in Oakland, they've been working virtually with Mike uploading reworked tracks online. "It's like a sound cloud," he said, describing the process. However it worked, the songs sound great. Sharing the bill at ATL is local songwriter John Ludington who, says Lila, "takes elliptical to new extremes. I find him totally unique and captivating as both a writer/arranger and performer." I'll second that. Elsewhere Friday, the Riverwood Inn brings in Portland's The New Iberians for mix of blues and hot Louisiana zydeco that will surely heat up the cold night. Friday at the Jambalaya San Francisco-based electro combo BLVD plays breakbeats and house music. Saturday the trio heads to Area 101 north of Laytonville for the 6th annual Emerald Cup medical marijuana competition, which also has music by Heavyweight Dub Champions, Wisdom and Something Different. On the reggae front you have Tanya Stephens at Mazzotti's Thursday, Dec. 10, making up for a November gig that didn't happen. Saturday, Humboldt's own Woven Roots play at Jambalaya with opening act Seed 'n' Soil, a new band assembled by Serge Mihaylo, fronted by singer/drummer Jude Osadalo who once played in Femi Kuti's band, with Gueren and Alex from Woven Roots. Sunday, at the Red Fox, it's Queen Omega, the young reggae singer from Trinidad (the island) with David Kirton from Barbados, plus locals Ishi Dube and AkaBoom Sound. How about some ska? Boston's Big D and the Kids Table is what I'd call a 5th Wave ska/pop band. Their tour with Brit ska band Sonic Boom Six from Manchester brings them to the Arcata Theatre this Thursday with a new local ska 10-piece, Killbot Factory opening the show. Also on Thursday, another Liquid Lounge at the Jam, this time with jazz by Weather Machine followed by Chris Wixson's soulful Speak Easy Saints. Corey Scoffern aka The Grouch returns for "How the Grouch Stole Christmas," a night of underground hip hop Saturday at Humboldt Brews with DJ Fresh, Mistah Fab and up-and-comers Fashawn and Exile. The holiday tour is also a Toys for Tots drop-off, gathering gifts for kids. "I wanted to add something that will make a difference, something beyond just entertainment and me, me, me," said Corey. "Toys were an easy place to start; next year I'll probably do food." It really 'tis the season, what with the frosty mornings and holiday music everywhere. The Arcata Interfaith Gospel Choir celebrates the season with a pair of holiday concerts: Friday at the Arcata Presbyterian Church and Saturday at the First Presbyterian Church of Eureka. Arcata's worldly a cappella combo, AkaBella, celebrates the coming of winter with Solstice Songs, a "family-friendly" concert at Arcata Presbyterian on Wednesday, Dec. 16, with sing-alongs and their take on traditional holiday carols including East Euro and Balkan tunes and a Zimbabwean-style "We Three Kings". That same Wednesday, Diamondback brings Matthew Shafer aka Uncle Kracker to Mazzotti's for an unplugged version of his country/rap/rock mix. Mark Mayo's alt. rock combo Black Irish opens. We close with some sad news: Sean Bohannon, former mandolinist for The Compost Mountain Boys and long-time manager of Wildwood Music, died in his Eureka home over the weekend. May he rest in peace.